Pep Guardiola issued a public apology after Manchester City rode their luck to storm back and beat Swansea 3-2 in the FA Cup quarter-finals on Saturday and stay on track for a quadruple. The City manager's decision to name Sergio Aguero and Raheem Sterling among his substitutes at the Liberty Stadium in south Wales looked set to backfire as the Championship side made the most of their absence to surge into a surprise two-goal first-half lead. Swansea looked set to end City's four-pronged pursuit of honours when they took command of the tie after Matt Grimes converted a 20th-minute penalty and Bersant Celina finished off a fine move by curling a shot beyond Ederson nine minutes later. 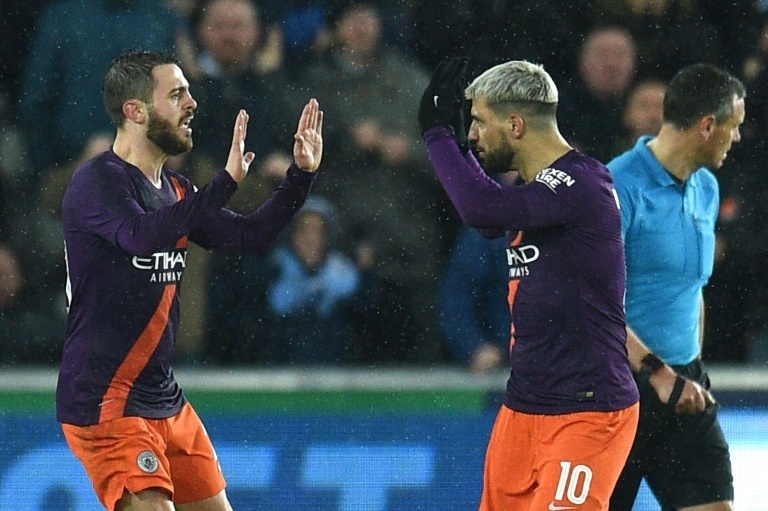 The Premier League leaders mounted a stunning recovery to overcome the daunting deficit after Sterling and Aguero entered the fray either side of the hour mark but the win was achieved in controversial circumstances with the equaliser and Aguero's winner hotly disputed. After Bernardo Silva pulled a goal back by curling a shot beyond the impressive Swansea goalkeeper Kristoffer Nordfeldt, TV replays suggested that City were the beneficiaries of two incorrect decisions by referee Andre Marriner that may have been overruled had the VAR system been in use. Marriner pointed to the spot after Cameron Carter-Vickers was judged to have tripped Sterling. Aguero's penalty struck the post and went in off Nordfeldt while Aguero's winning goal, a stooping 88th-minute header, should have been disallowed for offside. "If it is not a penalty, and it is offside like the people say, I'm sorry," Guardiola said. "They ask all the clubs about the VAR and all around Europe, the VAR is there and here it’s not. I don't like to lose games when the decisions are wrong but the referees don't want to make wrong decisions, but they must be helped. "It’s centimetres. Sometimes the VAR takes three minutes to make a decision so imagine taking that decision in one second during the game. It is not easy." "But, at the same time, we played incredibly well, with the amount of actions, the amount of crosses and the goalkeeper (Nordfeldt) was incredible," he added. "We will analyse the game -- we deserved to win the game by far -- but to win in that way, I’m sorry." In the end, Guardiola was left to sing the praises of Aguero, who had the final say in an exhilarating contest as he made up for lost time in dramatic fashion with his late winner. "He is on top form, he is an exceptional player and he’s enjoying those moments that only the world’s greatest strikers have which is nice for the team," he said. Guardiola, whose side have already won the League Cup and are through to the quarter-finals of the Champions League, added: "When you fight for all the titles you don't have rest and every three days there is a game, it is so, so healthy to win these kind of games. "You need these kinds of situations to go through, because there are a lot of games and different competitions every three days. Our physicality and mental approach is so demanding. We know every game we lose, we lose the competition." Guardiola was less impressed with the Swansea fans, who invaded the pitch following the final whistle with substitute Oleksandr Zinchenko appearing to be jostled by one supporter. "In the future we could have problems. It’s not nice but thankfully nothing happened," he said.